I stepped outside this morning and sniffed good deals in the air, so I hit the road. Check out this pile o' goodies! 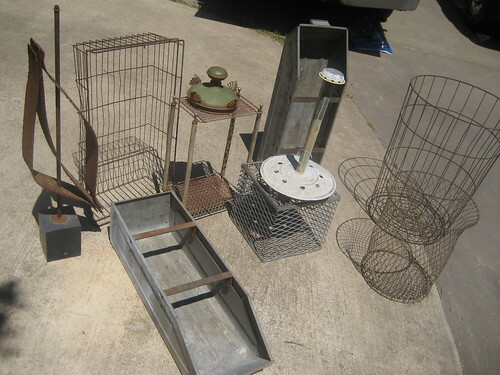 That metal sculpture (on the left) that might have once been a lamp? Mine! 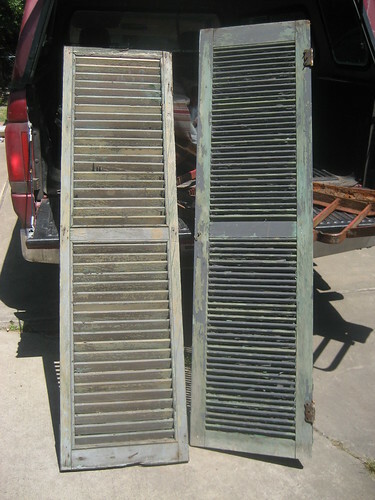 I got 4 of these fun chippy shutters. Prepare yourself. This is cool. What is it? I dunno. A tractor bumper? 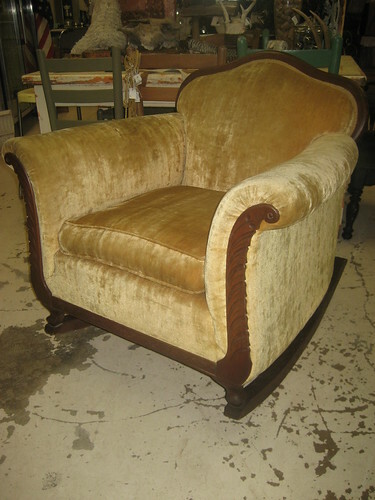 And here is that rocker that I mentioned earlier this week. More pics can be seen here. Super clean. Super comfy. It's good. I absolutely love the smell of bargains! Don't you? I am always amazed at the cool things you find! I never see things like that at a sale! And I love your blog! Always upbeat and fun! Thanks! I bet those bargains smelled REAL GOOD! Can you just pile your treasures on that superly fantastic 10' table and give em a push up north please??????? I bow down to you, oh finder of the bestest stuff! Lovin' all your cool finds !! you find the COOLEST stuff! oh how i love that metal wire and galvanized boxes. How much are those bins???? Love all your wonderful finds. I can see that big ole "bumper" in a rustic lodge in front of a big ole stone fireplace as a screen. Great finds! You really get unique things. Paul Wall ain't got nothin' on that grill! 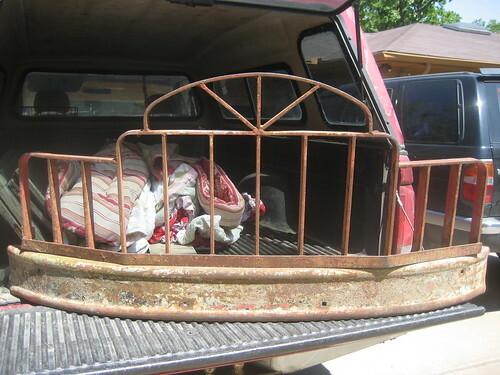 I think that it is a truck bumper. It would make a nice border and trelis in a garden. That tractor bumper needs to live in front of my fireplace. next time you go out to look for stuff, please take me along!!!! Pam, I love that idea! Deb, I had to google Paul Wall. Ha! Never heard of him. Mr. Flannery, what were you doing up so late? Whatever that big iron thing is, its cool! I can just see it in a garden. Mindy - I took a nap in the afternoon and got my biorhythms all out of wack. 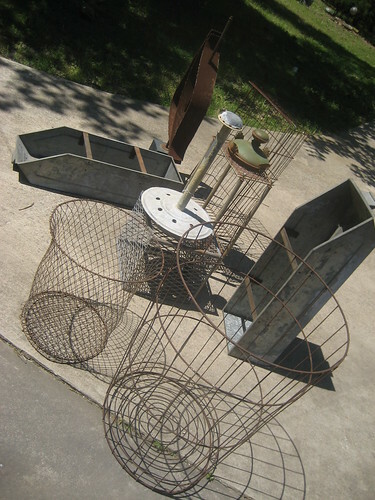 I found three of those steel bin things today at an estate sale. $6 for all three. Oh, Mindy, I'm just swooning over all that wire ware - it's one of my favorite things!